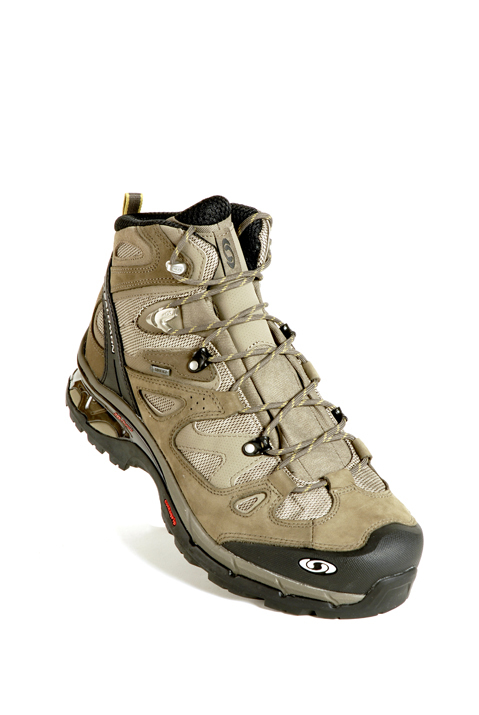 The Salomon Comet 3D GTX is a very lightweight boot at just 1356g (pair, size 11), and with the lower weight comes a change in performance when compared to heavier boots. The upper is made from synthetic materials with lots of stitching, so potentially this may not be as durable as a boot with one piece of leather on the upper and no stitching. The upper is quite soft too, with less stiffness in the toe box and heel cup areas, which means the Comet won’t support your foot as well as a stiffer model. This softness in the upper brings advantages too, as it feels comfy on the foot straight away. The outsole lacks a substantial heel breast but it does have well-spaced lugs that are nice and deep to grip well on soft grass and mud. The flex of the sole is softer than some others, but again this makes the boot nice and comfortable when walking on smooth paths and moorland. But take the Salomon Comet 3D GTX onto rockier ground and the flexible sole forces your foot to work harder than stiffer boots, which can be tiring if you aren’t used to it. I’d prefer to use this on moorland or good hill paths rather than anything too rocky on a regular basis. But if you want a lightweight option, that’s the price you might have to pay. The Salomon Comet 3D GTX’s price and weight are light, but this does limit performance on rockier mountain ground, making this best suited to valley and easier hill paths.